People for a Clean UC – Sunday, March 11, 7:30 to 9 AM; Cleanup volunteers meet at Starbucks, 3202 Governor Drive, beginning at 7:15. All supplies provided. UC Planning Group (UCPG) – Tuesday, March 13, 6 PM, conference room at Green Acres Restaurant, 10300 Campus Point Drive. On the agenda this month are the Pure Water sewage pipeline on Genesee Avenue, the Costa Verde Shopping Center update, and the cell phone towers at Doyle Park. They include an open communications segment during which non-agenda items can be brought forth. 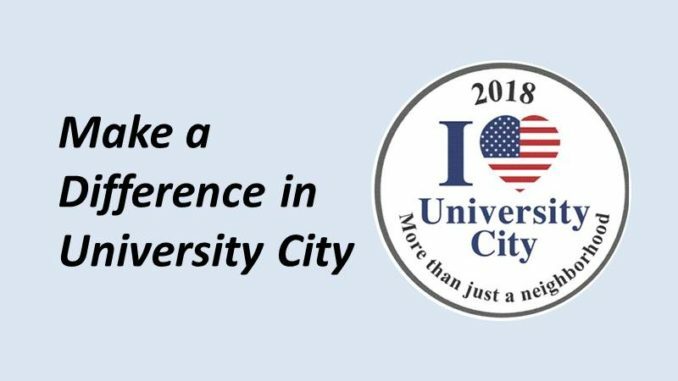 UCCA (University City Community Association) – Wednesday, March 14, 6 PM, University Community Library at 4155 Governor Drive. Representatives from Costa Verde will discuss latest renovation plans; update expected on Pure Water sewage pipeline project for Genesee Avenue. Meeting also includes an open forum section during which any non-agenda items can be brought forth for discussion. Garden Club meetup – Sunday, March 18, 2 to 4 PM. Contact Garden Club to register and for more information at ucgardenclub@gmail.com. Standley Recreation Council (SPRC) – Thursday, March 22, 7 PM, at the Recreation Center at 3585 Governor Drive. They include an open communications segment during which non-agenda items can be brought forth. Doyle Recreation Council – Tuesday, March 27, 6 PM, at the Recreation Center at 8175 Regents Road. They include an open communications segment during which non-agenda items can be brought forth.